The coconut mixture pairs well with the other ingredients and what better than to cover each with a blanket of silky, smooth low carb chocolate. A completely satiating, keto friendly treat that you can now make in the comfort of your own home. It’s always a plus when you can pronounce every single ingredient that goes into a candy and an even bigger plus when you’re provided with the health benefits it has to offer. Does a store-bought candy do that? Absolutely not. Your typical store bought almond joy candy bars are loaded with unnecessary additive and sugars that wreck your system. So we crafted a better-for-you candy that you’ll feel good about putting in your body. 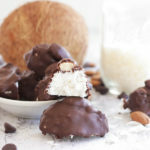 These Almond Joy Fat Bombs are loaded with antioxidants, support brain function and mental health, provide a healthy dose of energy, great for maintaining healthy blood sugar levels, and improve your gut health. They’re sure to become a favorite candy or fat bomb recipe to add to your ever-growing list of keto recipes. These fat bombs are sure to provide an explosive boost to your brain. Through its rich source of MCTs (Medium-chain triglycerides) coconut oil enables your body to quickly produce powerful and sustainable energy for your brain. In addition to provide fuel, research has linked coconut oils ability to aid in the prevention of cognitive disorders such as Alzheimer’s [*][*][*]. Dark chocolate is packed with flavonoids which deliver impactful fuel to your brain. Not only will it increase your clarity and focus, but studies have shown that it can improve the conditions of those suffering from various cognitive complications and diseases [*][*][*]. Almonds are abundant with properties that support brain health, including riboflavin and L-carnitine. Studies have linked almonds ability to aid in providing energy, focus, and clarity as well as reducing severity of significant cognitive complications [*][*]. Even through small amounts Vanilla can provide significant benefits to your mental health. Most specifically it has been shown to provide the ability to improve your mood, particularly for those suffering from depression and anxiety [*]. The antioxidant properties found in Almonds are incredible for your health and your body’s defenses against serious diseases. Research has linked Almonds antioxidants to assisting in the fight against many illnesses including cancers of the skin, breast, and colon, as well as reducing oxidative stress throughout the body and brain [*][*][*]. Dark Chocolate is abundant with antioxidants such as flavanols and polyphenols. These help fight against free radicals in your body and can aid in the prevention of serious diseases. Research has shown that chocolate is a leading natural source of these antioxidants and can do wonders for your health [*]. Besides delivering a deliciously sweet flavor, Vanilla also provides a significant source of antioxidants. These antioxidants have been proven to reduce oxidative stress and increase your overall health [*][*]. Almonds provide significant support to your digestive system. They’re packed with healthy fats, vitamins, and antioxidants that can greatly improve your gut health. They’ve been shown to aid in the improvement of your digestive tract, support your ability to properly absorb nutrients, and help detoxify harmful toxins [*]. Both coconut oil and coconut cream provide valuable aid to your gut health and digestive system. Coconut cream delivers much needed hydration and electrolytes to your system and can help with constipation and diarrhea. Coconut oil has ability to not only remove harmful bacteria from your gut but to also repair the lining and overall flow of your digestive system. Together, these ingredients significantly boost your overall digestive health. These little candies are the perfect, kid-friendly, treat to whip up on a Friday night with family or friends. Great for the holidays, a work party, your children’s soccer game, and basically any type of social gathering. P.S. If you’re at war with someone on whether or not they’re an almond joy or mounds fan, have no fear because you can make these sans almonds and there will be peace because everybody wins. We’re pretty sure you will literally feel joy after eating one of these gluten free, paleo Almond Joy Fat Bombs, and we don’t blame you. They tend to have that effect on people. Add 2 tablespoons melted coconut oil, coconut milk, sweetener, shredded coconut, vanilla extract, and salt into a small bowl. Portion and divide mixture into 12 even mounds or logs on a baking sheet lined with parchment paper. Place in the freezer to set for 5 minutes. Press 1-2 almonds onto the tops of each mound. Melt chocolate chips with 2 teaspoon of coconut oil in the microwave in 15 second increments until smooth. Remove coconut mounds from freezer. Coat each with chocolate. Refrigerate or freeze until set. I melted the chocolate in with it instead then scooped i like haystacks before chilling. So yummy!! Everyone loves this, even my sister, who doesn’t participate in diets! Thank you so much for taking the time and effort to put this recipe up for us! Note: I didn’t add ANY sweetener and it was still 100% well received. Wish I could give this 10 stars – it’s that good! Thank you SO much for the recipe! So delicious I just ate 3. I couldn’t wait! My only issue I had was with the nutritional values. I used everything you said to use and my calories came out to 131 each instead of 96. I used everything organic so I’m not sure how I came up with more than what your recipe shows. It was way too sweet for me. I will try again with cutting the stevia in half. These are delicious! Just slightly too sweet for my taste since I’ve been cutting sugar for quite some time. Next time I make them (and I will definitely be making them again) I will only use 1/2 of the recommended amount of the Lakantos.